Having a splashback in the Bathroom and Shower is an increasing trend because there are so many benefits over the traditional use of tiles. They look amazing and you don’t have to clean grout anymore. 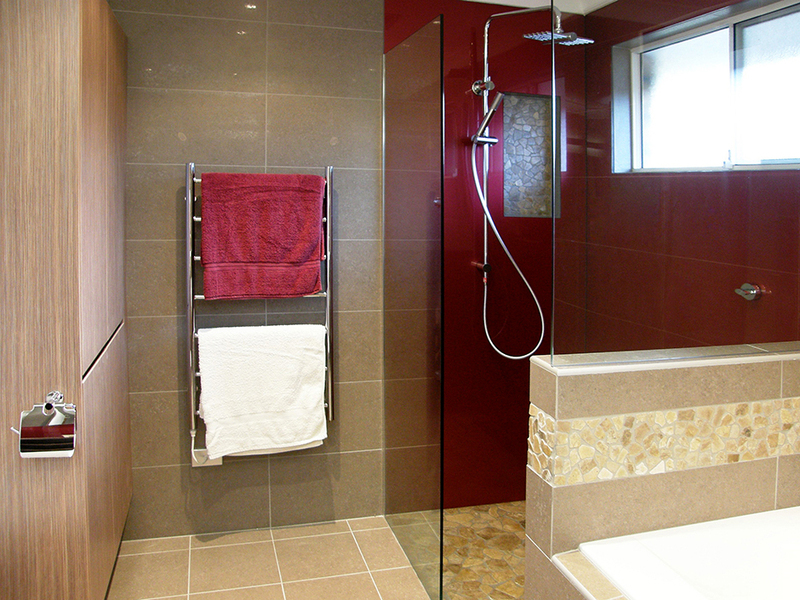 Imagine a shower recess without scum or mouldy grout, just an elegant, modern colour finish! 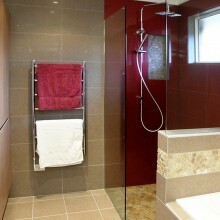 ShowerSplash® covers the walls of your shower recess with our stylish, cost-effective and hygienic Acrylic. 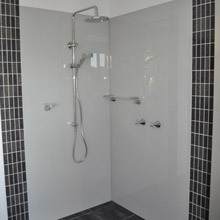 Available in an extensive range of colours, that can be mixed to suit almost any interior décor, our ShowerSplash® will add a fresh look and style to the bathroom or any other wet area. The perfect product for a DIY job as it can go over existing tiles and is light to handle. If you’re in Sydney North Shore, Sydney Hills District, the Central Coast or Newcastle we can supply and install your splashback for you. The professional touch will make sure your splashback fits properly and everything is cut in the exact location. The no stress, no mess and it’s fast. Our factory is equipped with precision cutting tools geared to cut Kitchen Splashbacks to almost any shape and size required by our customers. Add to this our ability to mix paints for Acrylic sheets to suit almost any interior décor and the options for a Do It Yourself job are limited only by your imagination. OzzieSplash wall coverings will not shatter. Acrylic has fifty times the impact strength of glass. The material is flexible and light resulting in safer installation. OzzieSplash Acrylic is a proven building material, guaranteed by the manufacturer for 30 years against UV discolouration. Acrylic Splashbacks Come In Range Of Colours As Wide As Your Imagination. We Use Any Dulux® Colour. Acrylic Splashbacks are available in a huge range of designer colours and here at OzzieSplash we can mix Splashback colours to almost any imaginable colour to suit your decor. Simply send us a sample of the colours that you prefer. This may be a tile, a piece of upholstery material or any other sample that clearly shows your preference. If you don’t have a ready sample, or you are in doubt about colours then we suggest that you use the Dulux colour range to select the colour that suits your personal taste. You can select your colour from the Dulux colour wall at any Dulux paint store or selected hardware retailers (e.g. Bunnings). Alternatively, you can browse the Dulux colour range using their online colour wall at http://www.dulux.com.au/colour/colour-wall.